This updated paperback edition of Inside the House of Money lifts the veil on the typically opaque world of hedge funds offering a rare glimpse at how today's highest paid money managers approach their craft. Now with new commentary, author, Steve Drobny takes you even further into the hedge fund industry. He demystifies how these star traders make billions for their well-heeled investors, revealing their theories, strategies and approaches to markets. Whereas some still maintain that rationality permeates financial markets, Drobny captures a different dimension, showing how the unquantifiable human forces of emotion and intuition are also at play. Along the way, readers get an inside look at firsthand trading experiences through some of the major world financial crises of the last few decades. Highly accessible and filled with in-depth expert opinion, this updated paperback edition of Inside the House of Money is a must-read for financial professionals and anyone else interested in understanding how greed, fear, and the human forces of emotion drive world markets. STEVEN DROBNY is the founder and CEO of Drobny Global Asset Management, an independent investment advisory, asset management and consulting firm focused on global macro and commodity hedge fund strategies. He is also the author of The Invisible Hands: Top Hedge Fund Traders on Bubbles, Crashes, and Real Money (Wiley). Mr. Drobny holds an MSc in finance and accounting from the London School of Economics and Political Science and a BS/BA from Bucknell University. 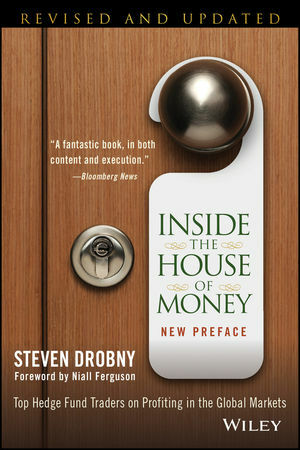 Please visit www.drobnycapital.com for more information on Drobny and this book.